Hi All, Is there a standard as to how non aero brake cables are to be routed with a set of drop bars? I've seen where both are behind the bar, both in front and also split where the front brake cable, usually, is in front of the bars. Both behind the handlebar seems correct to me, but maybe not for all circumstances? Here's how I and I'm sure many others route non aero brake cables. This routing works best as it does impede steering. It varies from bike to bike. Go with what works best and what looks best. - Zaphod is right though it can vary with the bike, the length of stem, location of the caliper etc. Try to choose a path to get a smooth transition for the housing - and try to maintain symmetry as Chombi illustrated above. whatever way the bike tells you. Generally, behind the bar, but if you have a short stem, in front of the bar may work better. I have a 60 mm stem, and it was a smoother bend to route the cables in front of the bar. Thanks everyone for the replies! My sister's Lambert is small framed (50-52 cm) with a short stem and narrow bars. The pictures really helped me in defining what a proper installation should look like. Also good to know that if I need to route the cables in front of the bars I won't break any rules... tradition counts in my book. In 1981 when working for Masi in Southern California, I went to a bicycle trade show in Atlantic City, New Jersey. Falerio Masi, founder of the company, flew over from Italy and met us there on the opening day. When I arrived at the Masi show display from my hotel that morning, Falerio was already there and very upset. He was speaking in Italian through an interpreter and flicking angrily with his finger tips at the brake cables on one of the bikes on display. I did not need to know what he was saying; I knew exactly what the problem was and why he was angry. The bike was set up (Similar to the bike pictured above.) with the brake cables running under and in front of the handlebars. This was a huge fashion Faux Pas in Europe, it drove me crazy too. Brake cables were supposed to flow in a pleasing curve from the brake lever, to the front brake, and to the top tube en route to the rear brake. The brazed on cable guides were precisely placed along the center of the top tube to facilitate this. That statement was probably true at the time. Many bikes being sold and ridden in the US were bought by people who today would buy a Mountain Bike, or a Hybrid. They were often set up like this Fuso (Above.) that came up for sale on Craig’s List last week. Frames were usually too big for the rider. (By European standards.) The result was, the saddle was too low, and usually the bars were set too high. The brake levers are set too high on the curve of the handlebars, and the levers start to stick out front like a pair of six-guns. This all indicates to me that the rider never should have been on a dropped handlebar bike in the first place, and I would rather have seen this bike set up with flat handlebars than set up looking like this. 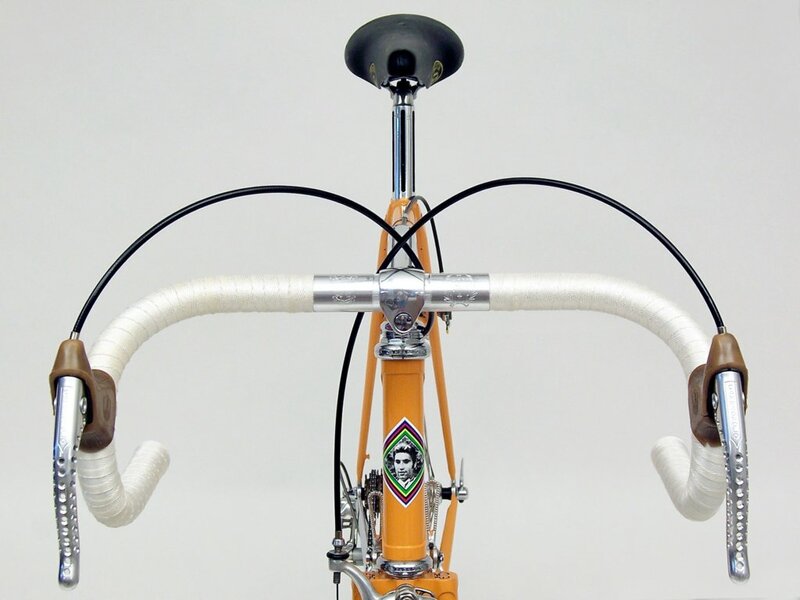 On an “Old Skool” bike, the external brake cables were an important part of the aesthetics of the overall look. On my own bike for example (Above, and close up below.) notice how the cables leave the brake hoods, following the same curve of the lever. Notice how the rear brake cable flows from the brake lever to the first cable guide on the top tube. It doesn’t matter if the front brake is on the right or the left, that is a personal preference. The top of the curve of the cables just happen to be level with the top of the saddle, which has nothing to do with anything. However, this being my correct size frame, the handlebar to saddle height ratio is also correct, this is most likely the reason why it turned out that way. 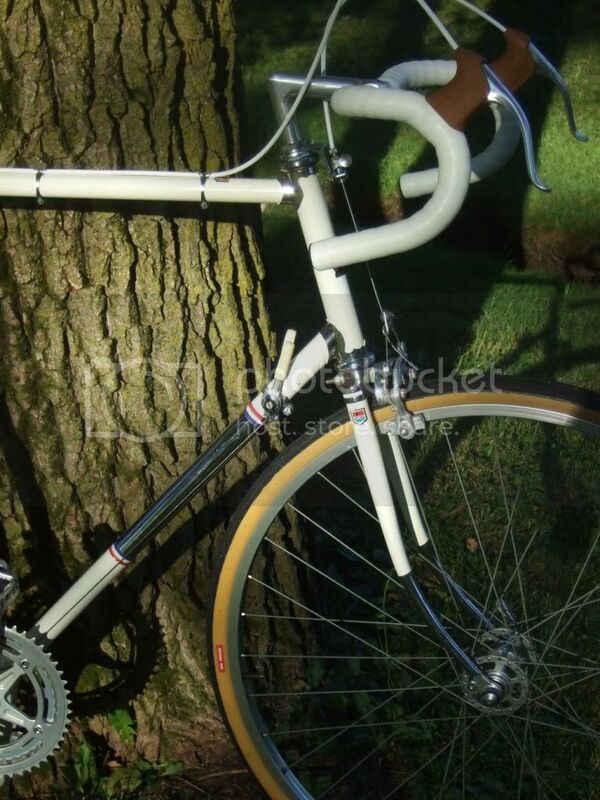 gaucho777, Nice tip about the cable arc/saddle height, thanks. Operate the brake lever as you hold the end of the cable/housing and route the cable. You will feel where there is greater or lesser friction in the housing. Use the path with the lowest resistance. I used this generic instruction because the tilt of your bars and location of thl evers on those bars both affect what is the best routing. I'm not sure of the technical term, but what about if your stem doesn't go forward very far? Mine is short on the horizontal plane. When routing my cables, it just seemed like they flowed better so I routed them in front of the bars. 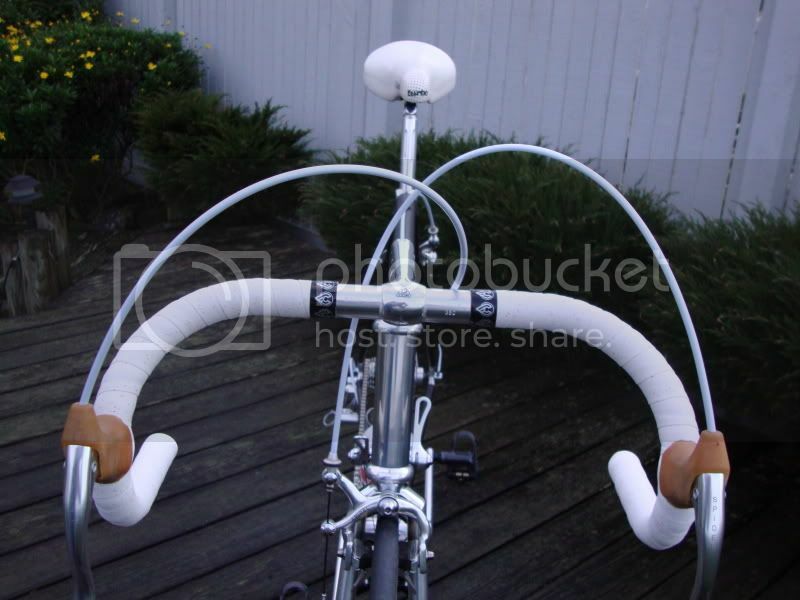 Otherwise the rear in particular has a fairly hard bend where it transitions from behind the bar to along the top-tube. Is there any reason to route them differently other than European fashion? Because I'm Really not too concerned with that. As mentioned already, you can route them in front of your bars if your stem is on the short side (less than 100mm?). Only thing with routing them in front of the bars is there is a tendency for the rear cable to kinda shoot too far forward and may induce more bending for the brake cable and casing than desired where it goes in at the lever tops. routing them behind the bars helps be cause the bar curves the cable upwards to produce a nice arc towards the rear brake lever top. Sorry, I thought that was referring to stems being short vertically. Still learning.